For every writer, one of the necessary evils is research. I do say evil with a grain of salt because research always stimulates my mind and helps clarify the story … and I quite easily get lost in research as it is fascinating. My current research topic is the Loch Ness Monster. 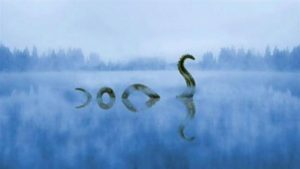 It is for a story that is in the baby developmental stages, so I won’t say anything more about it except I needed to know more than I did about Nessie. So, what did I know? 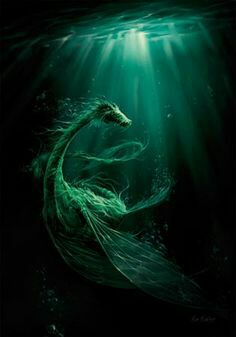 Before starting my research, I knew that Nessie is a native of Scotland, at least the sightings take place in Loch Ness, a large, deep, freshwater loch in the Scottish Highlands. The sightings have been received with skepticism over the years, in part due to the number of hoaxes which have been perpetrated regarding the existence of the monster. The most common depiction is of something large that looks much like an extinct plesiosaur, but the plesiosaur is too warm-blooded to have survived the climes of the Highlands and Loch Ness. My research has given me a lot of facts about the history, the sightings, and the hoaxes, some of which are funny. My favorite hoax is two-fold. Big game hunter Marmaduke Wetherell was hired to find the monster along with an actor and film crew. After a few days, Wetherell reported finding big footprints, so he made some plaster casts and sent them off to the Natural History Museum in London. 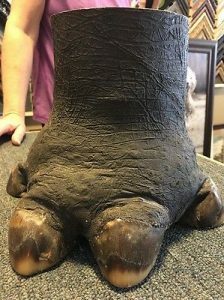 Imagine his embarrassment and dismay when the analysis returned the results that the prints had been made by a hippopotamus foot. And worse, it was a foot which had been turned into an umbrella stand. Wetherell had his revenge though. He returned hoax for hoax and one of the most famous pictures taken of the monster, which wasn’t debunked for 60 years, was created by Wetherell and his sons. They fashioned a neck and head and fastened it to a toy submarine and had a respected doctor send the picture into the newspaper. But though interesting, what I searched for wasn’t the accounts of the sightings or even the hoaxes. What I have been searching for is the lore … the myths which have given the Loch Ness Monster its staying power. At first all I found were accounts of sightings of a basically camera shy large aquatic animal and when the pictures were taken and whether they were debunked or not. I was slightly disappointed to find a reference to someone deciding that an article about a large fish wouldn’t grab much public attention, and so that is how the appellation of monster was applied. *sigh* How was it that the legend and stories have persisted through the years? These water-horses, or water-kelpies, are said to have magical powers and malevolent intentions. According to one version of the legend, the water-horse lures small children into the water by offering them rides on its back. Once the children are aboard, their hands become stuck to the beast and they are dragged to a watery death, their livers washing ashore the following day. Now THAT is what I had been searching for. And then I turned up the little tidbit stating that one of the Loch Ness Monster’s abilities was that of a shapeshifter. My imagination has been sufficiently charged and running away with how this information fits into the story as it develops. More research is ahead of me, but I have a direction and something concrete to run with. I love this! Thank you for sharing your research journey. I love new stories and findings. Research is actually one of my joys. And it’s exciting to see where it takes me.